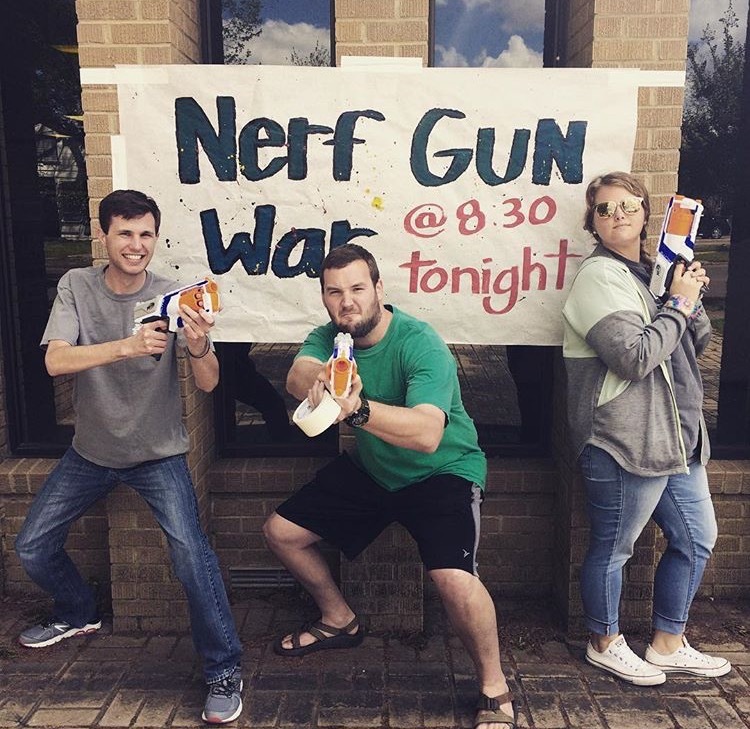 The Nerf Gun War had been the topic of conversation for weeks around the Baptist Student Union, or as we call it, BSU. People that didn’t even own Nerf guns and especially didn’t know how to use them and Nerf War veterans alike were talking about it. There was talk about how to set up the building and how to divide up teams. Strategy and talk about what gun was best could be commonly heard in conversations among BSUers as the day of war approached. Meanwhile, papers were still due and work still had to be done. Couples broke up as well as friendships. New romances were blooming like the tulips on Delta State’s campus. 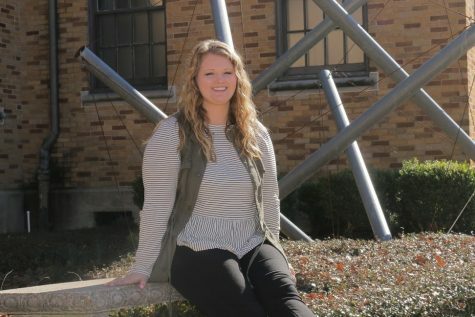 Roommates were fighting and stewing over past hurts, while other friendships were taking root and growing deeper, despite the fact that some would be leaving in May. People are people, as they say (whoever they is) and they still gossip and say things that are a blatant lies, because, in fact, colorful lies make for much better stories around a table of Chic-Fil-A nuggets and waffle fries in the union. I wish it were just as easy to swallow their empty words as it is to eat those nuggets from CFA. Finally April 6 rolled around, the Day of War. Caitlen and I were at the BSU every moment we weren’t in class trying to get it ready for that night. We took down chair after chair after chair and tables until I had to report back to class, leaving Caitlen to do the work on her own. It was a Thursday, and Thursdays are always restless. It’s almost the weekend, its’ almost there, but you still have to get up on Friday and force yourself to go to class and work just thinking about those plans you made for the weekend. The atmosphere felt like you’d had one too many Red Bulls after pulling an all-nighter just to finish that paper in one night you should have started weeks ago. The Nerf War only added to that restlessness. I came back to the BSU during my break before my next class and Caitlen had decided that we needed a sign to put on the outside of the building to bring people off the street. It was Thursday and I still didn’t have a Nerf Gun nor had I ever touched one in my entire life. I didn’t even hear about Nerf Gun Wars until I got to college. Somebody was going to let me borrow a few from their older brother’s arsenal that they had brought from home, which was over two hours away, if I supplied my own bullets. I gladly agreed. The BSU was beginning to fill up with people ready to divide up into teams and shoot each other with Nerf guns. All the semester’s frustrations had built up and everyone was ready to take them out on each other. The BSU looked like a war zone. There were boxes stacked up taller than me, turned over tables, and Nerf guns and bullets were everywhere. Only two teams were allowed to play at once, which meant there was time for socializing and catching up on the other side of the warzone. There were all types of people there. People that were ready with their face paint and matching colored clothes. There were people there that didn’t play a single round in the Nerf Gun War. There were people doing homework and people that didn’t sit out on a single round of the war. There were people that were honest and sat out once they had been shot three times, and there were people that never got out even though they had been hit ten times. There are always those people. There were people that talked smack and told everyone, “you’re going downnnnn” and there were people that didn’t say much and just let their Nerf guns do the talking. As the Nerf War went on, I started to ponder how much time I had spent with many of these people over the past couple years here. I knew the good and bad things about them whether they realized it or not. As people shot Nerf bullets at each other, I realized that there were people here that were here every week, that took literal shots at people they “loved” with their words and actions, that were always meant to hurt much more than a Nerf bullet ever would, and it angered me. I wanted to see them get exactly what I thought they deserved. I wanted to take shots at them because somehow I thought it made sense to treat them exactly like they were treating other people.